Back to the Future took place in 2015 and 2001, A Space Odyssey was set 16 years’ ago, yet our present-day feels somewhat bland compared to these hyper-realities. Our real-life hoverboards burst into flames at random, modern-day 3D technology gives half the population a headache, and space travel is still the preserve of professional astronauts. Yet, while Siri is hardly as useful as HAL in Space Odyssey, the future of bathrooms is continuing to progress at an impressive rate. According to European Cleaning Journal, one American entrepreneur has created the Fresh Air Plus, a toilet seat which uses sensors to discreetly remove any nasty smells from your bathroom. Another helping hand in bathrooms is Optiqo’s new hygiene display, which simplifies and digitises the washroom checklist, allowing any attendant to fill in their details with ease, effectively eliminating paperwork. 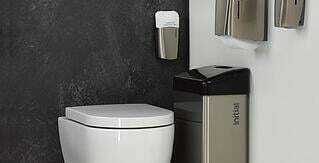 These are only two new products, but they point towards a bright future in the bathrooms industry. We’ve always looked to the future with our product range. But more than advancement, we care about quality, and we’ll always bring you the best service.